Worthing Raiders Rugby Club got their National 2 South home campaign underway with a hard-fought 20-17 victory over 14-man Barnes this afternoon. 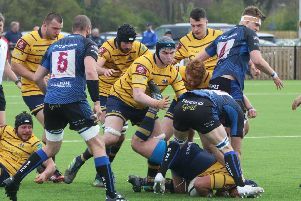 Raiders ran in three tries with Alex Wilcockson, Matt McLean and Joe Burns all going over to help Worthing to a success in their maiden league game at Roundstone Lane this season. Barnes, who saw Alastair Johnston shown a red card seven minutes before the break for an off-the-ground challenge on Dan Peach, made Worthing work hard but Raiders made it two wins from as many matches so far this season. Things didn’t start well for the home side as Tom O’Toole’s penalty handed Barnes a 3-0 lead after five minutes. Back came Raiders, though, and they had a first home score of the season courtesy of Alex Wilcockson four minutes later. Barnes’ backline was under continued pressure, before Wilcockson’s fine run saw him go over with McLean added the extras to hand Worthing a 7-3 advantage. Raiders were handed a man advantage after 28 minutes with Matthew Chambers shown a yellow after coming in from the side, which Worthing made the most of two minutes later. Despite dropping George Montgomery’s initial pass, McLean regained the ball to drive over the line for a second Raiders try. He skewed the conversion wide but Worthing still lead 12-3. A tough afternoon got even more difficult for Barnes seven minutes before half-time, Johnston was shown a straight red for a challenge that saw him lift Peach off-the-ground, with Worthing’s Scott Barlow receiving a yellow for his reaction to the incident. Despite finding themselves a man down, Barnes made a bright start to the second registering their first try on 44 minutes. A barnstorming run from Ciaran Smyth saw him go over, with O’Toole added the extras as Worthing’s lead was reduced to just two points. McLean kicked over a penalty two minutes later to help his side open a 15-10 lead. Disaster struck for Raiders on the hour with Jack Franklin pouncing on a gaping hole in Worthing’s backline to level the scores at 15 each. O’Toole fired over the conversion as Barnes found themselves in front for a second time. But Raiders weren’t to be denied as they went back in front with 12 minutes remaining. Following a line-out, Burns forced his way forward and over the try line to put Raiders 20-17 ahead. McLean couldn’t add the extras from a tight-angle but following a nervy final few minutes Worthing held on for another victory. Raiders make the trip to Bury St.Edmunds in the league next Saturday. RAIDERS: Gatford, Watson-Brooks, Burns, Barlow, Redmayne, Smith, Whittall, Perkins; Peach, Montgomery, Wilcockson, Richards, McLean, Coxon-Smith, Leeming. Subs: Hewick, Finney, Arthur, Lake, Nielsen.